The Paris Review, The Believer, Tin House. It's no surprise Showtime is turning American Dream Machine into a series. This book is fun. It's well written." American Dream Machine is the story of an iconic striver, a classic self-made man in the vein of Jay Gatsby or Augie March. It's the story of a talent agent and his troubled sons, two generations of Hollywood royalty. It's a sweeping narrative about parents and children, the movie business, and the sundry sea changes that have shaped Hollywood, and by extension, American life. Beau Rosenwald--overweight, not particularly handsome, and improbably charismatic--arrives in Los Angeles in 1962 with nothing but an ill-fitting suit and a pair of expensive brogues. By the late 1970s he has helped found the most successful agency in Hollywood. Through the eyes of his son, we watch Beau and his partner go to war, waging a seismic battle that redraws the lines of an entire industry. We watch Beau rise and fall and rise again, in accordance with the cultural transformations that dictate the fickle world of movies. We watch Beau's partner, the enigmatic and cerebral Williams Farquarsen, struggle to contain himself, to control his impulses and consolidate his power. And we watch two generations of men fumble and thrive across the LA landscape, learning for themselves the shadows and costs exacted by success and failure. Mammalian, funny, and filled with characters both vital and profound, American Dream Machine is a piercing interrogation of the role--nourishing, as well as destructive--that illusion plays in all our lives. Matthew Specktor was born in Los Angeles. He received his degrees from Hampshire College and Warren Wilson College. The son of a talent agent, Specktor grew up at the epicenter of the motion picture business, and worked as an executive for such companies as Tribeca Productions (Meet The Parents, Analyze This), Jersey Films (Pulp Fiction, Erin Brockovich) and Fox 2000 (Fight Club). The author of one previous novel, "That Summertime Sound," and one nonfiction book, "The Sting," Specktor's writing has appeared or is forthcoming in "Harper's," "Salon," "The Believer," "Black Clock," "The Paris Review Daily," and "Open City," among other publications. He is presently collaborating with James Franco on a film adaptation of Steve Erickson's novel "Zeroville," and working with Stephen Elliott on an adaptation of Elliott's novel "Happy Baby." Both films are scheduled for production in 2013. He has been a MacDowell Colony fellow, and is a founding editor of the "Los Angeles Review of Books." "Sprawling, atmospheric.... [American Dream Machine has] a feline watchfulness and a poetic sensibility that echoes Bellow's and Updike's prose rhythms along with their voracious, exuberant intelligence." "Richly engaging . . . . Specktor sees his Hollywood characters as three-dimensional and very human." "With coolness and precision, Specktor comes across as a West Coast Saul Bellow in this sweeping narrative, but his energetic, pop-infused prose is markedly his own." "Specktor's book deserves a special space in the L.A. canon, somewhere looking up at Pynchon and Chandler. Even as the narrator searches through his past to uncover the truth about his family, the author is searching, too." "...Matthew Specktor's American Dream Machine [is] a big and generous novel that functions both as elegy for a recent past and fictional anthropology . . . .it evokes a world with casual ease and unexpected tenderness, recalling and referencing lots of other fiction (both Hollywood and non) while contriving to establish its unique authority." "American Dream Machine takes readers into situations that might seem familiar: the drug-fueled party at a star's house in the hills, tense meetings between executives, dimly-lit wood-paneled bars filled with players and movie stars. Yet Specktor's lyrical writing and insights into human nature elevate the novel into fresh territory." "[American Dream Machine] is a vivid evocation of the entertainment business from the 1960s to the near present, an L.A. bildungsroman and a murder mystery, all wrapped in one . . . entertaining package." 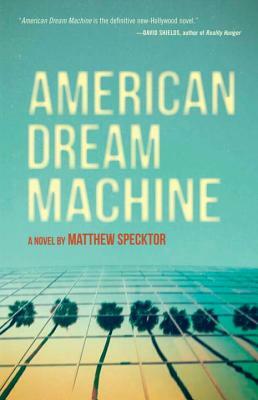 "[American Dream Machine] is an exciting, heart-rending fictionalized journey through the 40 years of Hollywood history . . .Specktor has woven Nate's and the town's dreamlife into the very fabric of his storytelling, and the result is profound, heart-stirring talecomic, melodramatic, tragic, toothat brings the dark heart of Hollywood desire into the brilliant pitiless light of the California sun." "American Dream Machine is grand, complex, lush, intelligent and lively, funny as hell and generous in ways you don’t often find. It’s also a strikingly original portrait of Los Angeles. People speak of Chandler’s Los Angeles, or Didion’s, or Nathaniel West’s. Someday, they’ll speak of Specktor’s the same way." "American Dream Machine may be the first literature I've read in which Los Angeles is assumed as London is assumed by Dickens and Paris by Proust and New York by a host of twentieth-century American writers. There is nothing ironic, ambivalent, or apologetic about Specktor's relationship to Los Angeles -- as it is and was, as myth and as a thriving capitol city. Los Angeles provides an animate pulse under the lives of these men and boys, a source of permanence that lends their struggles gravity." mythology. Somehow, here, Matthew Specktor has figured out a way to do so." "This is the novel about Los Angeles that I've been waiting for--a mythical LA full of longing and distances and illusion. Specktor has captured the LA I know, the one all around me and the one in my head, a city of invention and grit, surface and underbelly. Funny, poignant, and gorgeously written."